Fingertips main service is to quickly and accurately transcribe digital voice files. With today’s advances in technology, dictation can now be received from anywhere in the world within minutes. Nowadays everything has gone digital hasn’t it? It’s the same for digital voice files. Over the last ten years digital dictaphones have gradually replaced the old cassette type. Cassette dictaphones are still used but not as much. There are many reasons for this, such as those listed below. Secretaries have more work space as there is no need for bulky cassette transcribing machines. No need to store and archive tapes. Digital audio files lend themselves to work sharing and easy distribution and organisation. Instead of having one tape containing lots of letters, each letter can be its own file. Digital transcription is extremely effective and efficient for managing workloads. Recording time can be several hours. Easy editing as dictation can be marked and referred back to. Dictation can be emailed immediately to recipient within minutes. No need to be tied to the office to get documents done. 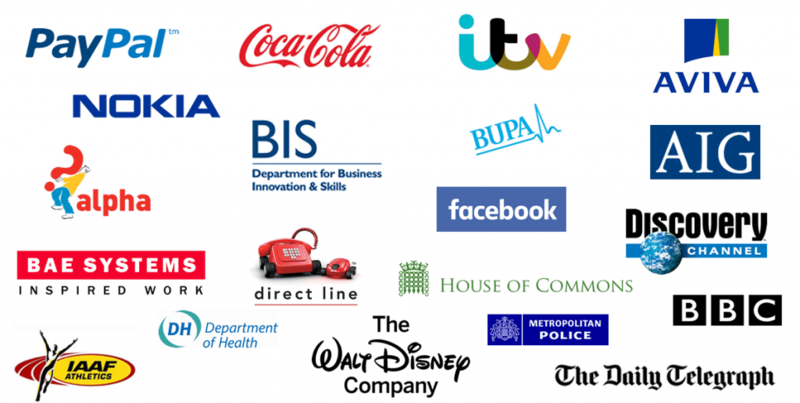 If you are office based, dictate direct to the PC for fast turnaround. As each machine can be given a unique ID, people can send files over a network into a central resource but all files remain easily identifiable. Below is a diagram of how digital dictation is uploaded and transferred to the transcriptionist. If you are unsure about which dictaphone to purchase please contact us and we will discuss your needs. Recorders that produce DSS files are ideal because DSS files are compressed files and therefore upload very quickly. To find out about the different types of files produced by recorders, please see our technical section. 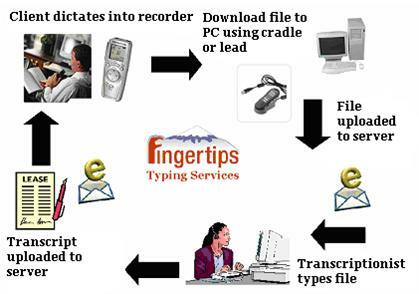 Fingertips main service is transcribing digital voice files. With today’s advances in technology, dictation can now be received from anywhere in the world within minutes. Digital dictation machines can be purchased from a wide range of suppliers and are revolutionising the workplace. See our Outsourcing Equipment page. Dictation is carried out using the same method as cassette dictation i.e. using a hand held recorder, but instead of recording onto a tape the recorder has a memory chip. This chip is either stored on the recorder or a memory card depending on which recorder you buy. Memory cards are recommended for users who dictate lengthy files. Normal recorders provide approximately 4 hours of recording time on standard play. Digital dictation machines can be purchased from a wide range of suppliers and are revolutionising the workplace. See our Outsourcing Equipment page. To download your dictation you will firstly need to load the CD that comes with the recorder. When you have finished dictating you download the file by connecting your recorder to your PC via the USB port using a lead or cradle. Once the file is on your PC it can be uploaded to your web folder or emailed to a Fingertips for typing. Secretaries transcribe using suitable digital transcription equipment (foot pedal, headset and software). Our digital transcription software can play a wide range of digital voice files including dss, wma, mp3 and wav. Please see our page named Technical Information which explains dss transcription, wav transcription, mp3 transcription and wma transcription as these are the most common. If you require other forms of digital audio file transcription then please contact us and we will confirm to you that we can transcribe it. Dictation can also be recorded on mobile phones, including the I-Phone and Blackberrys. Dictation can be emailed to us from both the I Phone and Blackberry. The email address is fingertips@attachments.com. Speak clearly and spell any unusual names or technical terms. Avoid using voice activated recorders as the recorder takes a split second to “wind up” and the beginnings of sentences get cut off. If you are recording a meeting, purchase a conference microphone so that all the participants’ contributions can be picked up. Also each time a member in the meeting speaks, if they state their name, this will save time in us deciphering the different persons and therefore the transcription time will be faster. If you are particular about punctuation, dictate commas, new paragraphs etc, otherwise we will punctuate your work for you. Please contact us for all your digital transcription needs.